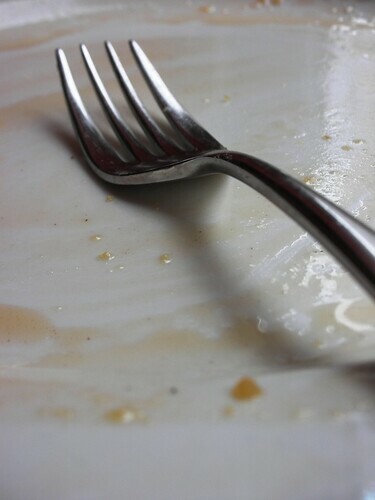 Pancakes, hotcakes, flapjacks, griddlecakes…whatever you’re callin’ ’em, I’m lovin’ ’em! Without a doubt, they are my favorite breakfast. In theory, I relish the idea of ordering pancakes in a café: letting someone else do the work for me while I rub my eyes and sip cappuccino. It’s not so much the cooking itself, but the thought of all that washing up afterwards (and in the morning!) that bores me to tears. In practice, though, I make them at home quite often, because the restaurant ones are so often heavy, dense and disappointing. Of course, if you look around enough, you can find restaurant pancake excellence, and in Sydney my gold star goes to Bill Granger’s ricotta hotcakes. There are three bills restaurants here in the Big Smoke and, although I’m partial to the Woollahra branch, they all serve the same delicious hotcakes. So light, thanks to the creamy ricotta and meringue folded into the batter, they are like little puddingy, syrup-drenched souffles. Luckily, Bill doesn’t keep his recipes secret, and since I have his cookbook bills Sydney Food, I’ll be able to make these myself when I am no longer living such a short drive from pancake bliss. If you have an Italian or gourmet store that sells fresh ricotta in the deli case, do yourself a favor and buy a little tub of that. I hadn’t tried fresh ricotta myself until a few months ago, and couldn’t believe the taste and texture–so much better than the prepacked, mass produced stuff. And, at least where I normally shop (at Norton St. Grocer, but I see it all over the place), it’s less expensive and I can just buy what I need. Low fat is what I get, and it works great here. Note: Hotcake batter can be stored for up to 24 hours, covered with plastic wrap in the refrigerator. -Place ricotta, milk and egg yolks in a bowl and combine. -Sift the flour, baking powder and salt (and cinnamon, if using) into a bowl. Add to the ricotta mixture and mix until just combined. -Place egg whites in a clean dry bowl and beat until stiff peaks form. With a large metal spoon, fold the meringue through batter in two batches. -Heat a large non-stick frying pan, cast iron skillet or griddle over medium heat. Lightly grease with butter (I like to lightly spray mine first, then butter) and drop two tablespoons of batter per hotcake. Don’t cook more than three per batch. Cook over a low to medium heat for two minutes, or until hotcakes have golden undersides. Turn hotcakes and cook on the other side until golden and cooked through. -Transfer to a plate. Dust with icing sugar and serve with fresh fruit and maple syrup. Those pancakes call my name, Steph! Hummm… and you went along and ate ’em still? Yum! 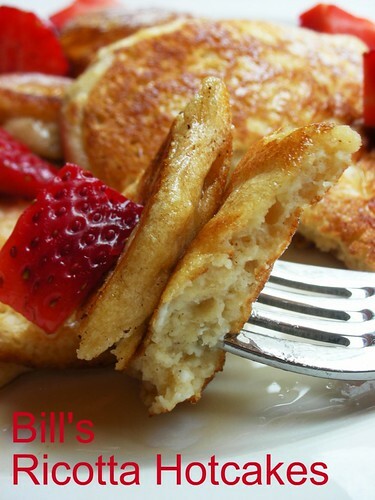 When I was in Sydney we went to Bills and my bf got the ricotta hotcakes- they were really yummy. Unfortunately my corn fritters werent 😦 For fluffy hotcakes I use a recipe by Marcus Wareing but I definitely want to give these a go myself! Oh my, that’s a GORGEOUS stack of hotcakes!! Hi, I really enjoy your blog and it’s very comfortable in the middle of my google reader cooking/baking feeds :P.
I just wanted to offer my opinion that the title you add to the first photo in each post detracts from the photograph which is always very well done. Maybe its just my personal opinion, but I don’t like captions on photos. They look so good! I have all Bill’s books and when i went to Sydney visiting Bill’s was at the top of my to do list! I actually met him when i was helping at a cooking class he taught a few years ago and he was just as nice in person as you would think he would be! 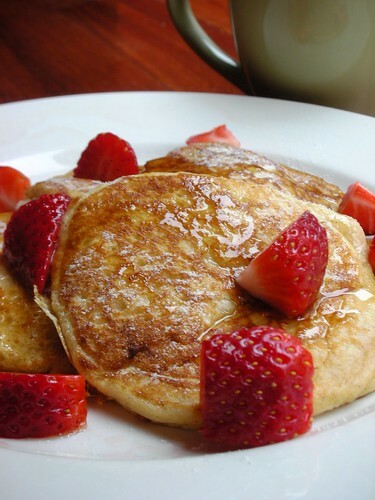 Amanda-I have made cottage cheese pancakes, too, and they are great! That recipe was quite similar, actually, and I bet that here the two cheeses could be used interchangeably. lior–Thanks for reading, and I appreciate your input. I know that some people like the captions, and some aren’t into it. I’ve used the titles since I started posting, so I’ve kind of just gone with it ever since. Tammy–I also have all his books! How fun to have met him! I’ve seen him twice at his restaurants (once he was with two of his cute little girls). those look awesome! i am such a sucker for pan/hot/griddle cakes. i have always wanted to try ricotta. one of those food network hotshots (tyler, maybe) has a recipe for ricotta lemon cakes. always wanted to try those. YUM. merci beaucoup steph pour la recette 🙂 je les ai essayés…ils sont parfaits et vraiment excellents ! Thanks for the comment, Ben! Yes, if you go to Sydney, Bill’s is a must! Wemoved back to the US about a year ago, but I still make these pancakes all the time!